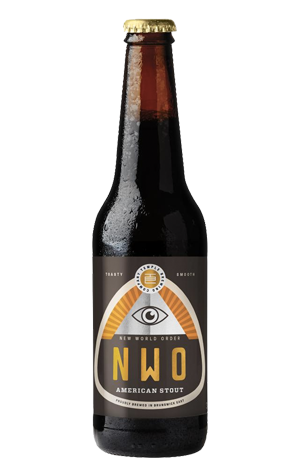 The Illuminati liveried NWO Stout has been a part of Temple’s lineup since the early days of its rebirth, driven by then head brewer Glenn Harrison's love of such beers, and has managed to pick up a string of medals at beer awards over the years. It's a pretty opaque, damn near jet black beer with only a slight ruby tinge and, being American influenced, has a pronounced hop aroma upfront, operating mainly in the realm of citrus and berry. As for flavours, there are blackcurrant notes and a pine hit in a beer that leans towards the herbal on the hop front, alongside some sweet cocoa, nuttiness, a little of that roast and even some molasses too.